When we are talking about criminals or fugitives on the run, we must always bear in mind that we must be extra careful in whatever we do in our surroundings. We do not know if someone might suddenly appear right in front of us and do harm us. That’s totally insane! To help us be more vigilant and be cautious on the people that we might meet on the streets, it is really helpful to have a list of those wanted persons especially criminals. You may also see examples of advertising poster design. Usually, police and agents would disseminate wanted posters containing the name and picture of the fugitive as well as their corresponding bounties. In this way, we will know and we can recognize them when we encounter them face to face. This is the traditional use of a wanted poster. 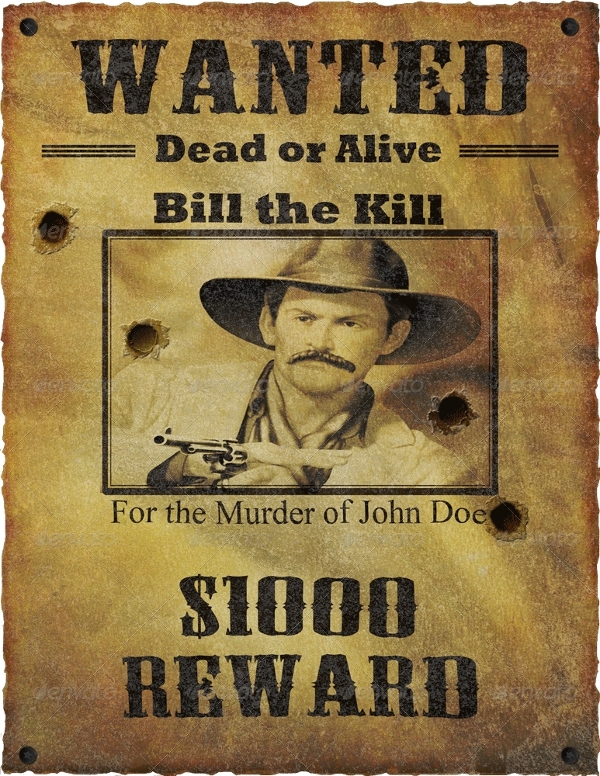 However, nowadays, with lots of editing software, wanted posters are also used for fun, prank, and even just for an artistic design. You may also like event poster designs & examples. 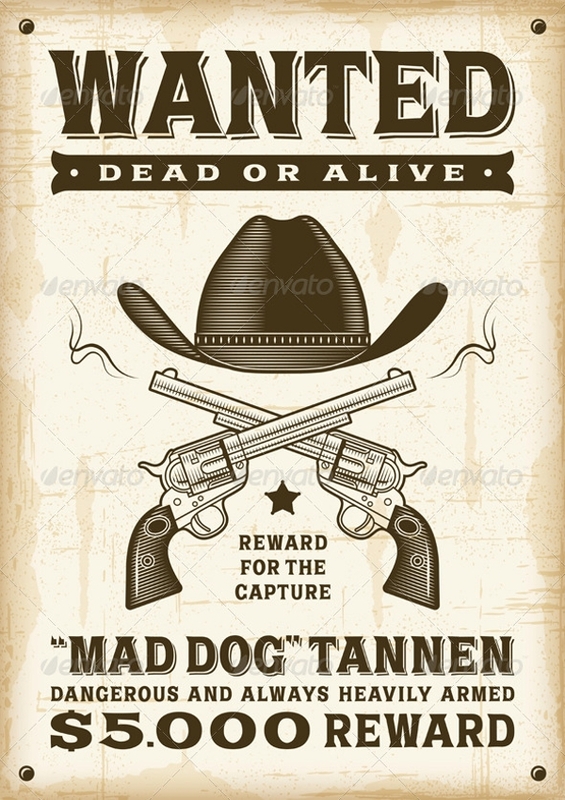 Technically, a wanted poster, also called wanted sign, is a poster disseminated with the intention of letting the public know of a person, an alleged criminal, whom the police or proper authorities wanted to apprehend. Commonly, a picture of the said person is included in the attractive poster or an artist’s sketch if a picture is not available. Other information in the wanted poster may include the wanted person’s name or nickname, the corresponding bounty, as well as a brief description of the crime for which they are sought. 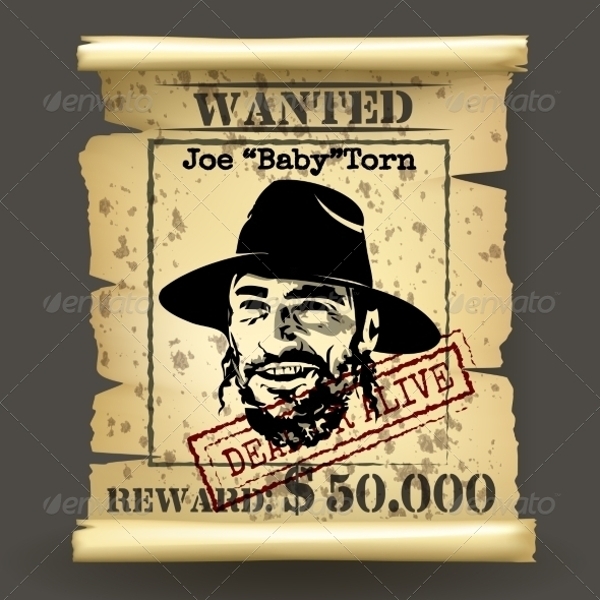 Nowadays, as technology is evolving, wanted posters are not merely used for posting names and pictures of criminals or fugitives but are also incorporated with humor and are no longer used in the concept of how it should be used. For example, in birthdays, the celebrant’s name and photo may be incorporated in a wanted poster and that will serve as his main attraction for his birthday party. You may also like event poster designs & examples. 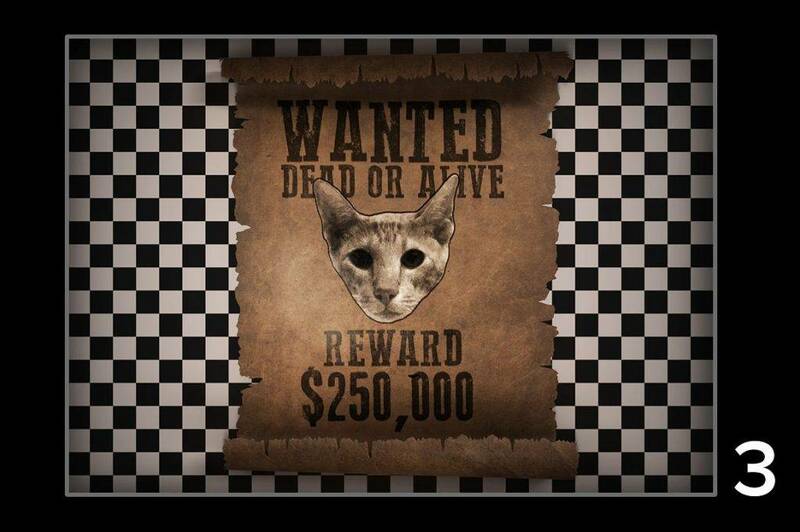 You may also use the wanted poster with your name and photo in it in your social media account. 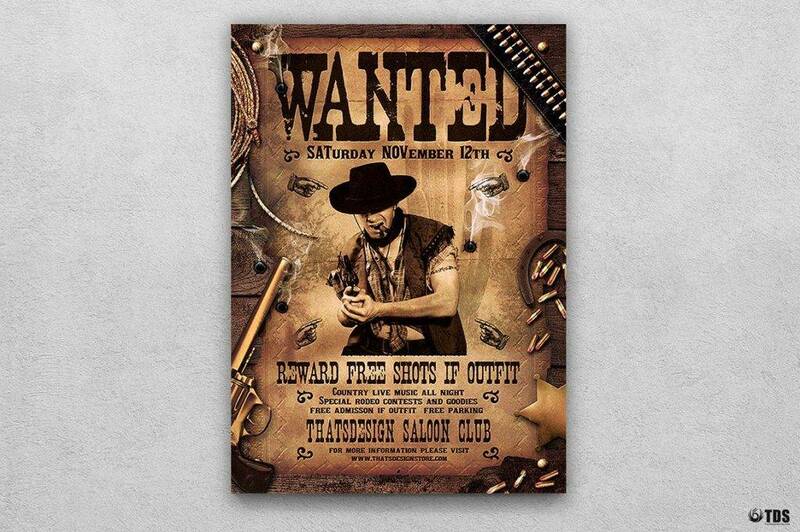 There are a lot more ways in which you can utilize the wanted poster as a design or decoration. It was mentioned in the previous section that there is a corresponding bounty offered to those who can provide information leading to the capture of the wanted person. What then is a bounty? Generally, bounty serves as an incentive for citizens who will aid the authorities in looking for a certain criminal either by providing information or by catching the criminal themselves. There are even some people who made it as a profession of chasing wanted persons with the intent of collecting their bounties, and they are called bounty hunters. They are also known as bail enforcement agent, bail agent, recovery agent, bail recovery agent, or fugitive recovery agent. You may also see examples of vintage poster design. Alphonse Gabriel Capone, also known by the nickname “Scarface” was an American mobster, crime boss, and businessman. He was also viewed by many as modern-day Robinhood because he made donations to various charities. He was the the co-founder and boss of the Chicago Outfit, also known as the Outfit, the Chicago Mafia, the Chicago Mob, or The Organization, who has been involved in a wide range of criminal activities, such as gambling, prostitution, bribery, conspiracy, burglary, coercion, labor racketeering, police corruption, hijacking, extortion, loansharking, political corruption, and murder. You may also like easter poster template examples. Lester Joseph Gillis, also known as George Nelson or popularly known as Baby Face Nelson, was an American bank robber and a gangster. He was given such nickname due to his youthful appearance and small stature. But his criminal associates called him “Jimmy.” He entered into a partnership with John Dillinger and help him escape from prison during the famed Crown Point, Indiana Jail escape. You may also check out poster billboard designs & examples. Henry McCarty, also known as William H. Bonney, Henry Antrim, and Kid Antrim and popularly known as Billy the Kid, was an American Old West gunfighter known to have killed eight men. He also participated in New Mexico’s Lincoln County War. He was first arrested for stealing food, clothing, and firearms in the late 1875. He later escaped and joined a group of cattle rustlers after murdering a blacksmith which made him a wanted person in Arizona. He was said to be a gambler, a horse thief, and an outlaw. You might be interested in labor day poster templates. Bonnie Elizabeth Parker and Clyde Chestnut Barrow were American criminals who traveled the central USA with their gang, robbing and killing people, during the Great Depression, a severe worldwide economic depression that started in the USA. They are known for their dozen-or-so bank robberies and their gang is believed to have killed at least nine police officers and several civilians. You may also see printable event poster designs and examples. D. B. Cooper is a media epithet used to refer to an unidentified man who was a suspect of the hijacking of Boeing 727 aircraft and escaped by jumping out with a parachute. Despite an extensive manhunt, he has never been identified or captured and there were no conclusions reached if he survived his high-risk jump. You may also like outdoor billboard designs & examples. Jack the Ripper is the name given for an unidentified serial killer who was involved in to the crimes of female prostitutes in the East End of London whose throats were cut prior to abdominal mutilations. He was called the Leather Apron and Whitechapel Murderer because of his series of eleven brutal killings in Whitechapel. It was believed that the killer had some anatomical or surgical knowledge as evidenced by the skillful removal of internal organs from at least three of the victims. You may also check out examples of billboard designs. James Earl Ray was said to be the assassin of Martin Luther King Jr. He was first convicted for burglary in California. Next is of mail fraud after stealing money orders in Missouri, then forging them to take a trip to Florida. He was also convicted of murder, prison escape, and armed robbery. His criminal penalty was 99 years of imprisonment, in which one year was added after his recapture, totalling 100 years. However, he died in prison of complications due to chronic hepatitis C infection. You might be interested in examples of minimal billboard advertising. 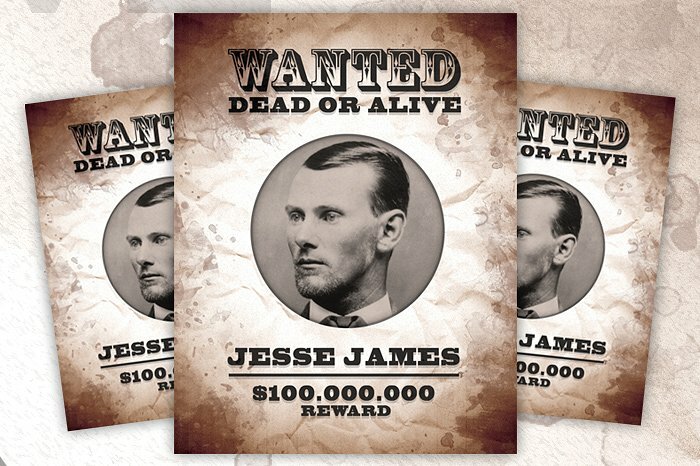 Jesse Woodson James, simply known as Jesse James, was an American outlaw and the leader of the James–Younger Gang. He also joined the pro-Confederate guerrillas known as “bushwhackers” during the American Civil War. He and his brother, Frank, also robbed banks, stagecoaches, and trains across the Midwest. He was shot dead by a new recruit to his gand, Robert Ford, who hoped to collect his bounty and became a legendary figure of the Wild West after his death. You may also see food billboard designs & examples. John Herbert Dillinger was an American gangster during the Great Depression in the USA. He and his group, the Dillinger Gang or Terror Gang, was accused of robbing 24 banks and four police stations but escaped from the jail twice. His criminal charge was bank robbery, murder, assault, assault of an officer, and grand theft auto. His criminal penalty is imprisonment from 1924 to 1933. John Wilkes Booth was the American actor who assassinated President Abraham Lincoln. He shot President Lincoln once at the back of the head with a .41 caliber Deringer, and the President died the next morning. After the assassination, he fled to southern Maryland, but he was tracked down. You may also like examples of billboard advertising. Booth’s companion gave up; however, Booth refused saying, “I prefer to come out and fight.” He was shot by Union soldier Boston Corbett after the barn in which he was hiding was set ablaze because according to the soldier, Booth raised his pistol to shoot them. Pablo Emilio Escobar Gaviria, or simply called Pablo Escobar, was a Colombian drug lord and narcoterrorist. He was also called Don Pablo, El Padrino, El Patrón, El Señor, El Mágico, El Pablito, and El Zar de la Cocaína. He was the founder and head of the Medellín Cartel, a highly organized and much-feared Colombian drug cartel in Medellín, Colombia. 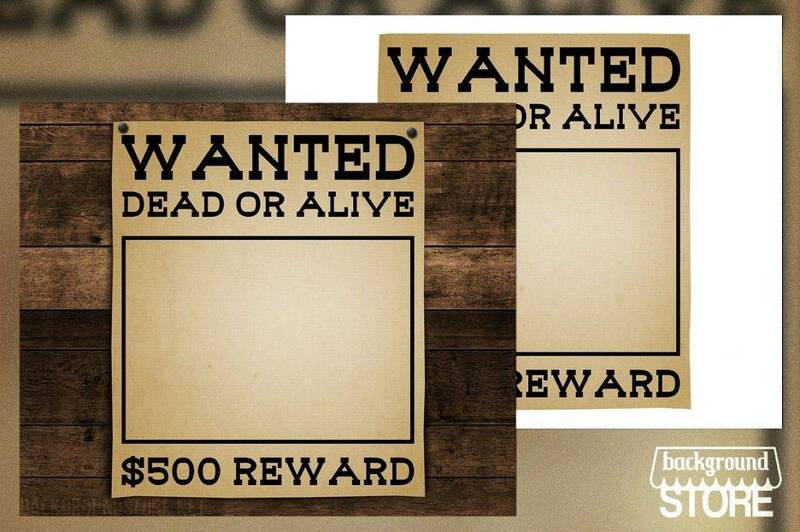 Wanted posters nowadays are not necessarily those that prove their context, the one that posts the information of a wanted person—a criminal or fugitive, but can also be used as a design or decoration. 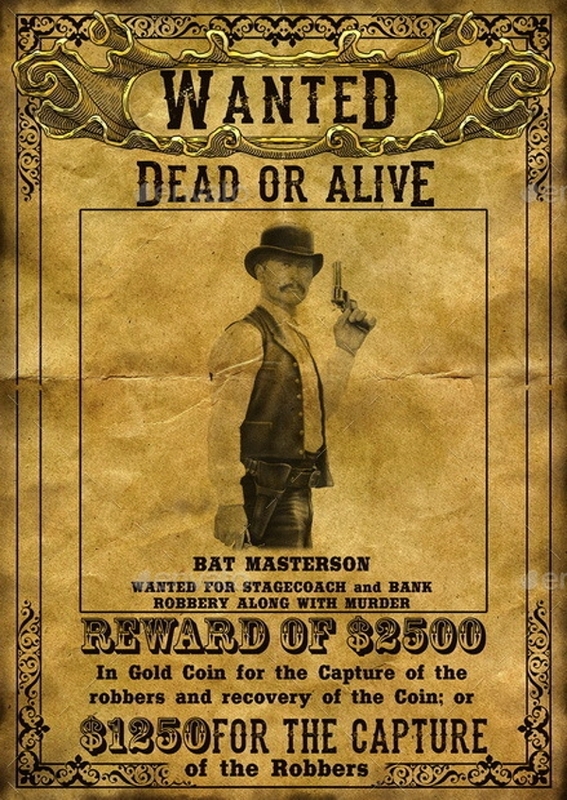 The main and original purpose of wanted posters is to let the public know and be warned of a person, an alleged criminal, sought after by the authorities. They usually have corresponding bounties with them, an incentive for those who can provide information leading to the capture of the wanted person or those who can catch the fugitive themselves. You may also check out vertical billboard designs and examples. Among the famous wanted posters are as follows: Al Capone, Baby Face Nelson, Billy the Kid, Bonnie and Clyde, D. B. Cooper, Jack the Ripper, James Earl Ray, Jesse James, John Dillinger, John Wilkes Booth, Pablo Escobar. All have different crimes, but one thing’s common for sure—they are very elusive. You might be interested in retro billboard designs and examples. 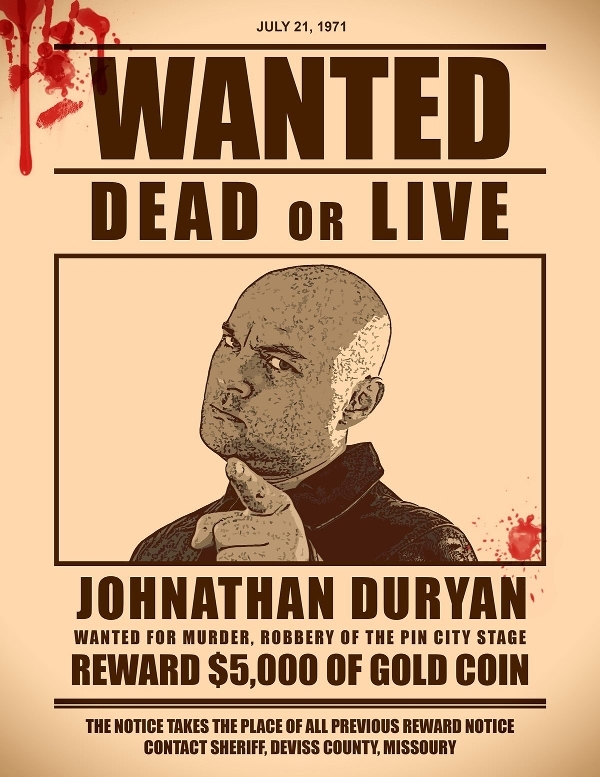 Lastly, to reiterate, you may also use wanted poster as a design, too. 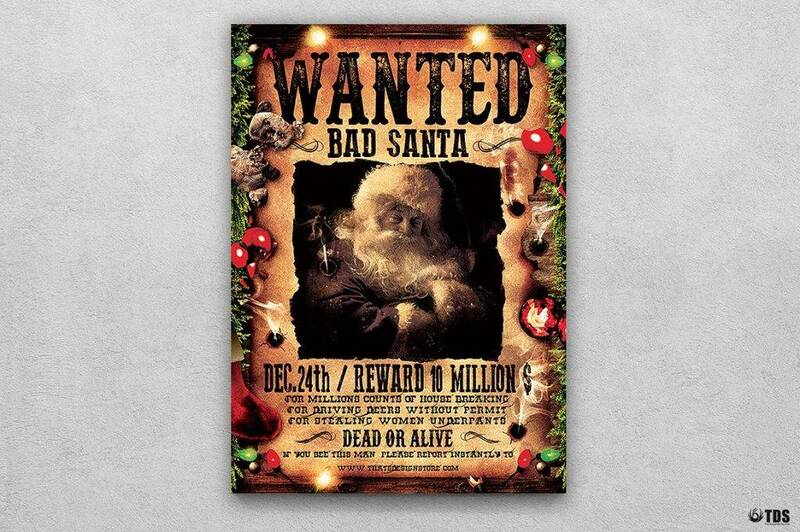 Don’t forget to check out the above examples of wanted poster designs.